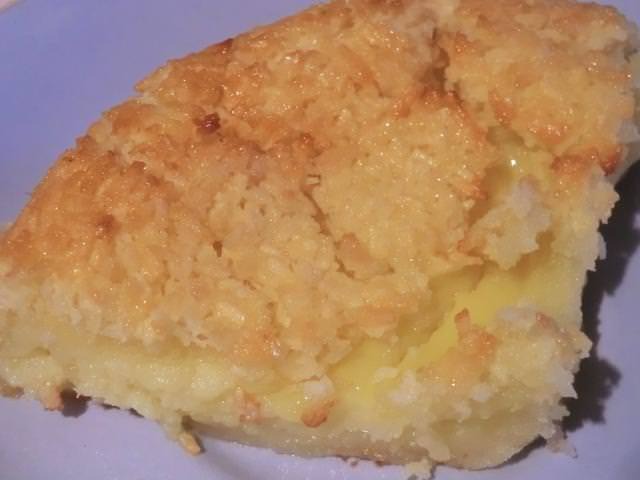 Mini “Magic” Coconut Pie Plus a Chocolate Variation | Cooking is Fun … Really!! NOTE: I corrected the amount of flour listed in the recipe below as I realized I had written it incorrectly as the full (rather than the halved) recipe amount. I had plans for a coconut dessert this weekend, as well as the chili etc., but it didn’t happen. 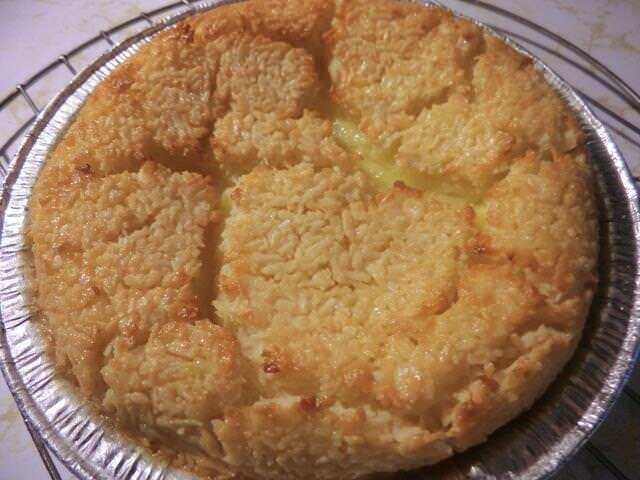 I still had a coconut craving when I got home from work today, though, so I made a “Magic” coconut pie. What does the term refer to, you may ask? Well, it’s one of those dishes in which all the ingredients are whisked together and then, during baking, they separate into a crust, filling and some sort of top. And because I didn’t want to be eating it daily – and doesn’t that sound familiar – I decided to scale down the recipe, which supposedly serves six, to half that. 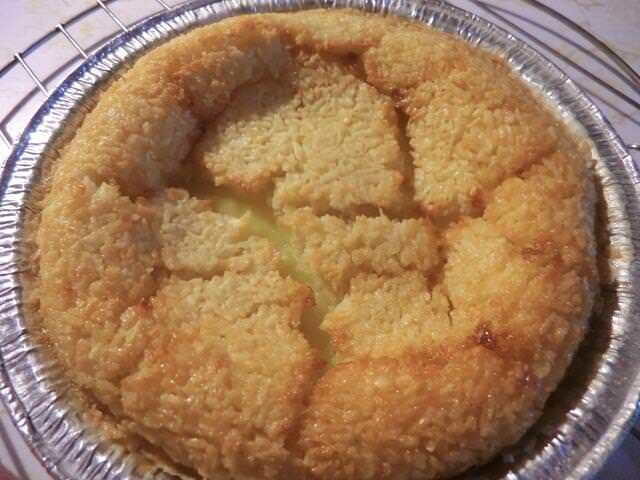 I had to do a couple of adjustments since my shredded coconut was unsweetened, and I used melted margarine instead of butter. I’m posting the revised recipe below. In a medium sized bowl, mix all the ingredients together with a whisk or hand blender. Pour into a buttered and floured 5 1/4-inch wide pie dish. Place on a baking sheet in case of spills. Let cool, slice and serve with a scoop of sweetened whipped cream or a small scoop of ice cream or gelato. Chocolate Variation: Substitute 1 tbsp of cocoa powder for 1 tbsp of the flour in the recipe above. After 20 minutes, the pie showed little change. After 25 minutes, it’s puffed up to almost double in size, there’s cracking on the surface, which is pale. The custard inside seems moist. 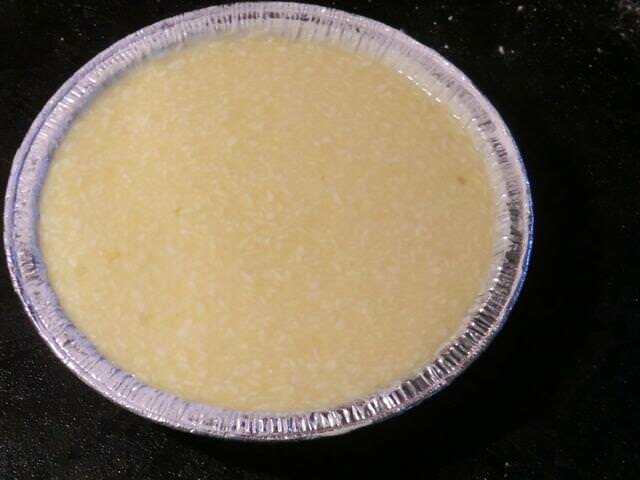 After 30 minutes, the surface of the pie has darkened somewhat and the custard seen through the cracks seems more set. 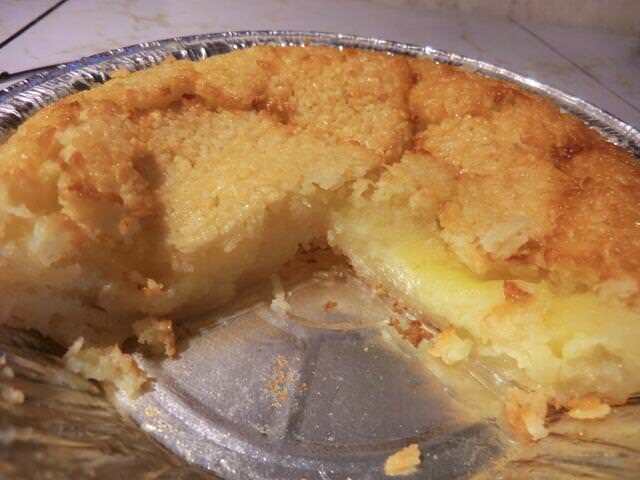 After 35 minutes, a toothpick inserted into the ‘custard’ filling comes out clean and the top is nicely browned. 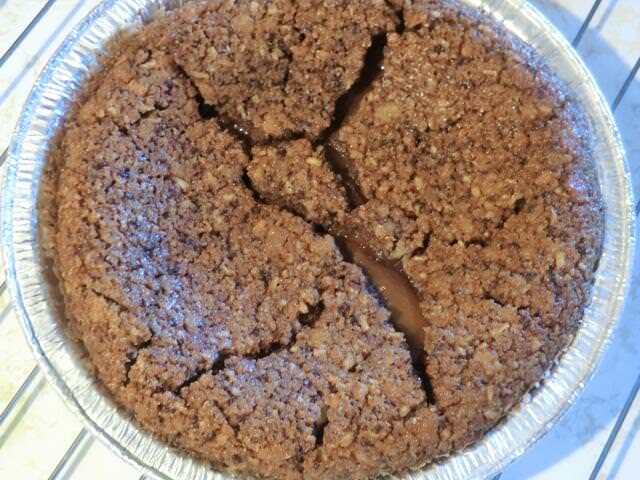 Upon removal from the oven, the pie slowly deflates and about half an hour later, there is a definite depression in the central 2/3 of the pie. The crust is defined but a bit soft and not like a ‘regular’ pie crust. Taste-wise, it’s delicious. And not overly sweet. I wish eating sugar and cakes didn’t mean weight gain. I’d inhale this cake. I am definitely making this one – a delicious no-brainer! In a large bowl, mix all ingredients together with a whisk or hand blender. Pour into a buttered and floured 9-inch wide pie dish. Bake in a 350 deg F oven for 40 min or until golden brown and set. Thank you so much! This is my project for tomorrow. Do you think I could add come cocoa powder, just a little, without causing it any harm? I would make a mini pie and try substituting one tbsp of cocoa for 1 tbsp of flour … if you want to wait, I can try making one on Saturday and let you know the result. PS: I just made one less than half an hour ago. It’s too warm to cut but the custard has set in the same time as the regular version, 35 min at 350 deg F for the mini version. It looks great. Mini pies in my house don’t last for more than a minute – someone has a major sweet tooth! I am planning to make it tomorrow for Friday night, expecting guests. Thank you for your advice and for a great recipe! Since I only have time for one try today, I’ll do 1 tbs and drizzle chocolate syrup on top. The more chocolate, the better! I definitely could eat the whole pie! I’ve made a magic cake dessert before and they are quite interesting. The coconut version looks delicious. I always scale down recipes, but I find the easiest way to do it is to convert everything into weight and then it’s a lot easier to scale down. It takes a bit of time, but I feel it’s more accurate. Plus, you could keep a running list of measurements that you’ve already converted and use it as a reference. After 40 plus years of using cups/oz etc, I can’t be bothered. Dividing recipes into half, thirds or quarters isn’t particularly challenging. I also tried a new pie crust ‘recipe’. I made the chocolate one, and it was INHALED! Everybody loved it – thank you so much for a great recipe! It didn’t get to be refrigerated. it disappeared. I will look at the other one, of course! In many ways the dessert reminded me of clafouti … a classic French dessert that disappointed me due to textural issues. I made it with fresh berries rather than cherries. I make something similar that I call Total Immersion Pie, also with fresh berries.